This is Michael Lortz’ first piece as part of his June residency at FanGraphs. Lortz covers the Tampa Bay baseball market for the appropriately named Tampa Bay Baseball Market and has previously published work in the Community pages, as well. You can find him on Twitter, as well. By most accounts, Tampa Bay is a growing region. There is job growth, revenue growth, housing growth, and billions in development happening throughout both Tampa and St. Petersburg. But one number that is not growing, despite an increase in expendable income, is attendance at Tropicana Field. Fortunately, the main reasons why the Rays continue to struggle at the gate have become somewhat well known. Most knowledgeable Tampa Bay residents and baseball fans know Tropicana Field is too far from the population center and the gridlock too tangled for enough fans to see the Rays on a daily basis. This media appears to have become aware of these particular challenges: we’ve seen fewer national editorials of late blaming the Rays’ fanbase for lack of attendance. There’s still the occasional tweet, but published commentary criticizing Tampa Bay sports fans for lack of Rays attendance is rare. Regardless of how often the problem is covered, there aren’t many articles offering solutions. That is a problem. From the outsider’s perspective, it seems the Rays are running out of ideas to get people to the ballpark. While they can only put so much lipstick on the pig that is Tropicana Field, they’ve altered prices, involved their people in the community, and offered a smorgasbord of various promotions with varying results. The lack of attendance is putting the Rays in a bind: without revenue from attendance and with lower-than-average broadcast revenue, they have to rely on revenue sharing to stay competitive in one of the more affluent divisions in baseball. And there’s skepticism from baseball owners and front-office personnel throughout the sport as to whether Tampa Bay can ever be a successful major-league market — despite the fact that four franchises spring train in Tampa Bay, two others train just over an hour away, and four minor-league teams call the region home. At my website, I’ve covered Rays attendance since 2007, the last year the Rays had the Devil in their name. Over the history of the franchise (excluding the inaugural season), there have been four different eras of Rays attendance. As you can see, even with more recognition and more active ownership, the Rays now draw as many people to Tropicana Field as they did during the Dewon Brazelton years. That’s not a good thing. There are a few theories as to why Rays attendance has continued to plummet. The first and most obvious is the team’s lack of winss since Joe Maddon and Andrew Friedman departed for greener pastures. That said, the Rays only won 77 games in their last year under Maddon (2014) and still drew 1.4 million fans. The next season, they won 80 under the leadership of Kevin Cash and drew under 1.3 million. So with more wins did not come more tickets sold, which seems to run counter to convention. Another theory is that rivals no longer draw as they once did in Tampa Bay. 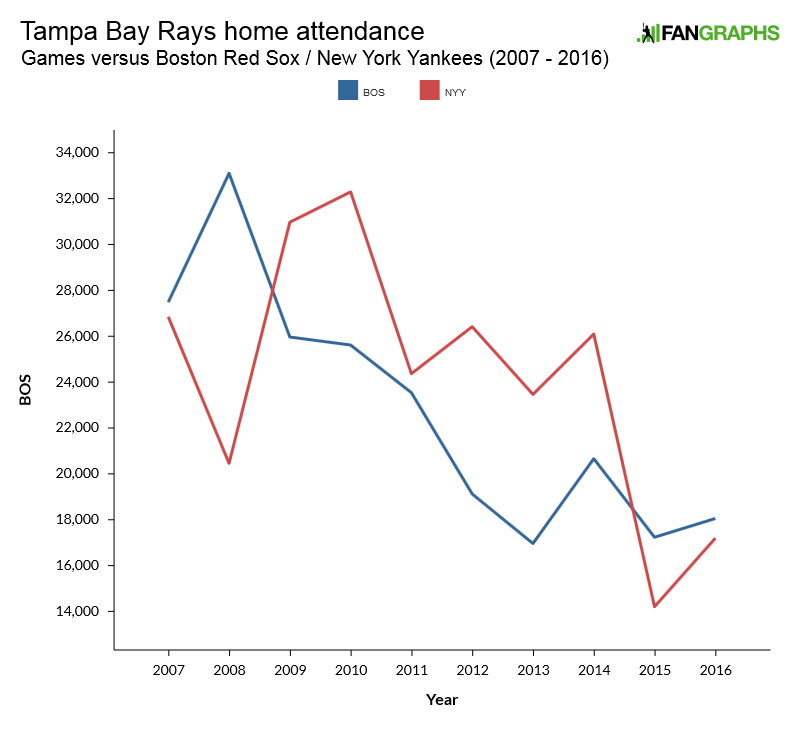 The retirement of Derek Jeter and David Ortiz and the presence of less established stars on the Yankees and Red Sox have compelled fewer opposition fans to flock to Tropicana Field. In 2016, for the second year in a row, average attendance for games at Tropicana Field against the Yankees and Red Sox was below 20,000. 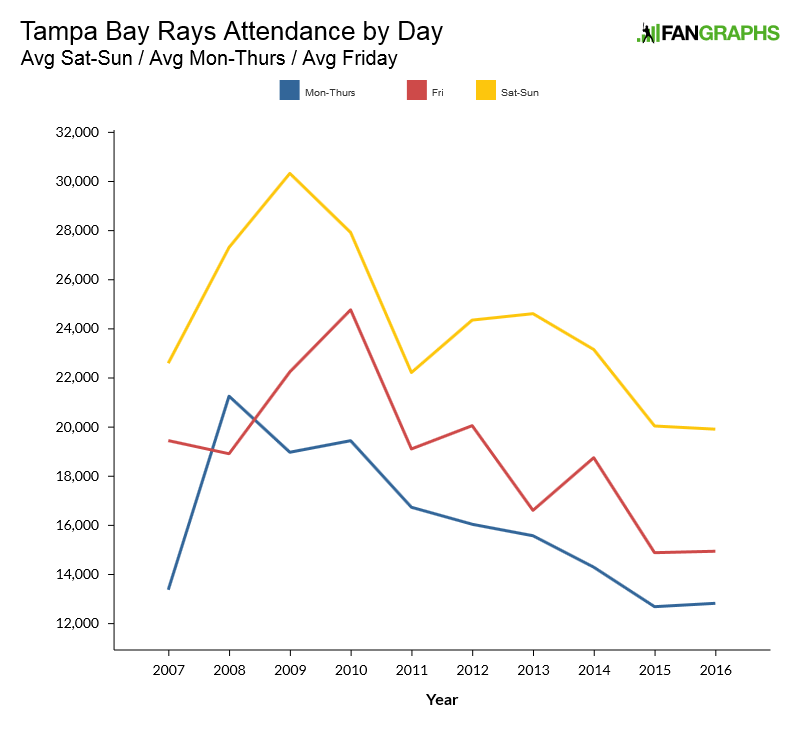 A third theory as to why Rays attendance has decreased is the decline of Friday attendance, specifically. A few years ago, I wrote a Community post here that explored the difference in attendance between weekdays (Mon-Thurs) and weekends (Fri-Sun) and the locality of fans to stadiums. Teams that have over 2 million people within 30 minutes of their stadium had smaller differences in weekend-weekday attendance. The Rays had the fewest fans within 30 minutes of their stadium and the highest difference in weekend-weekday attendance. Recently, however, Friday attendance has been more like Monday-Thursday attendance than Saturday-Sunday attendance. Years ago, Fridays rose and fell like weekends – most likely due to opponents – but, in the last few years, Friday attendance is barely above that of any other weekday. This might mean that whichever club the Rays are playing no longer has as much weight in Friday ticket-buying decisions and that fans are choosing not to fight gridlock to the ballpark. A fourth theory on the Rays’ recent decrease is that promotions no longer have the impact they once had. The Rays postgame concert series is a great example of this phenomenon. Concerts used to draw over 30,000; now they’re paired with other promotions to allure fans. 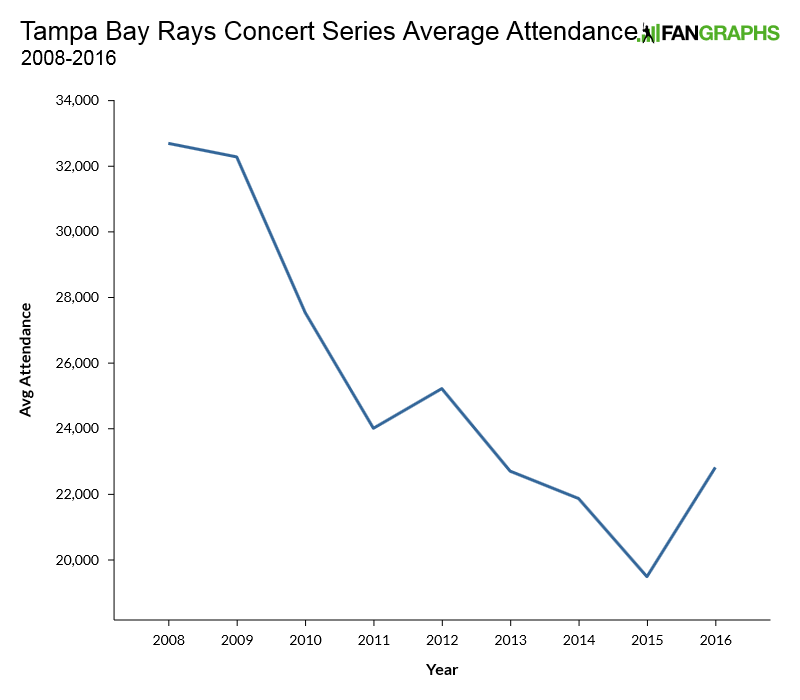 The Rays’ front office admits that the concert series hasn’t been the draw it once was and have reduced the attraction from 10 postgame concerts in 2010 to only three in 2016. There are several other reasons why I feel the Rays are struggling in the Tampa Bay market. Stadium location is undoubtedly the most prominent, but is a new stadium a silver-bullet solution? Over the next few weeks, I’ll theorize and hypothesize and possibly arrive at some solutions to one of the biggest problems facing one of Major League Baseball’s most unsettled franchises. We hoped you liked reading Tampa Bay’s Attendance Problem by Michael Lortz! This is well written. That’s a plus. It is a topic not usually covered here, that’s a plus. It’s gutsy to write a series on Tampa here, that’s a plus. Looking forward to this. But can Rays fighting gridlock function as high-leverage multi-inning relievers?